The technology of color still photography that came with Kodak’s Kodachrome film in the early 1960 and of color television broadcasts in the latter 1960s influenced the clothing of a wide range of public figures who knew they would be appearing in still or moving images. Many of the First Ladies adopted monochromatic colors for this reason. Barbara Bush followed this tradition with the choice of her Inaugural ball gown, made in a deep royal blue color. Although she later joked about not having fancy clothing like her predecessor Nancy Reagan, and even used self-deprecatory humor to describe herself as “wrinkled,” plump and white-haired, Mrs. Bush paid attention to style as much as any of her fellow First Ladies. Sensitive to the attacks Nancy Reagan received for her appearance, however, even were Barbara Bush personally inclined to emphasize fashion, she sought to avoid anything that drew attention away from the President or reflected poorly on him. 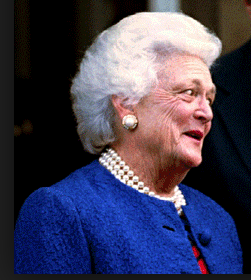 Barbara Bush remained largely the same, in the look of her clothing style through her tenure from beginning to end, but there were certain distinctions that came to be identified as her signature look. She showed a strong preference for a royal blue, lighter in tone than her inaugural gown, and it was dubbed “Bush Blue” but the fashion press. The other unique style she preferred were jacketed suits with square shoulders and large, round cloth-covered button in a wide variety of red-blue-and-blue configurations in polka dots or stripes. She also helped popularize a large-size white pearl and was almost never seen without it. Without intending to do so, even before her husband was elected president, Hillary Clinton was the subject of women’s fashion reporters for sporting headbands to hold back her long hair, while she made campaign appearances during the 1992 Democratic presidential primaries. 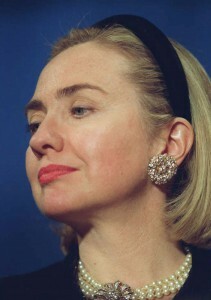 The “Hillary Headband” spoke not only to her relative youth among First Ladies going back to Jacqueline Kennedy but also her representation of a new generation of political spouses who not only fulfilled traditional tasks but also held down full-time professional positions, in her case as an attorney. 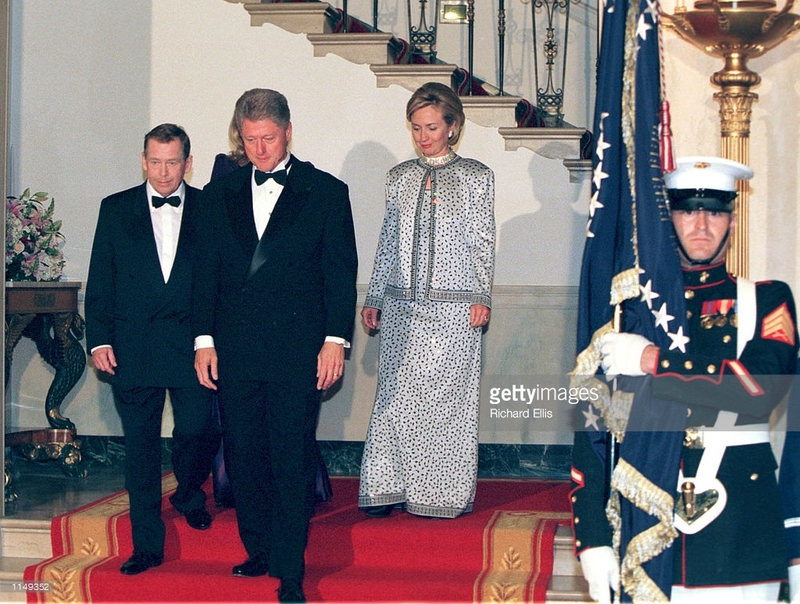 Clinton’s early years focused most of her time on work and study, and with limited funds she was prevented the privilege of indulging extravagantly on clothing. 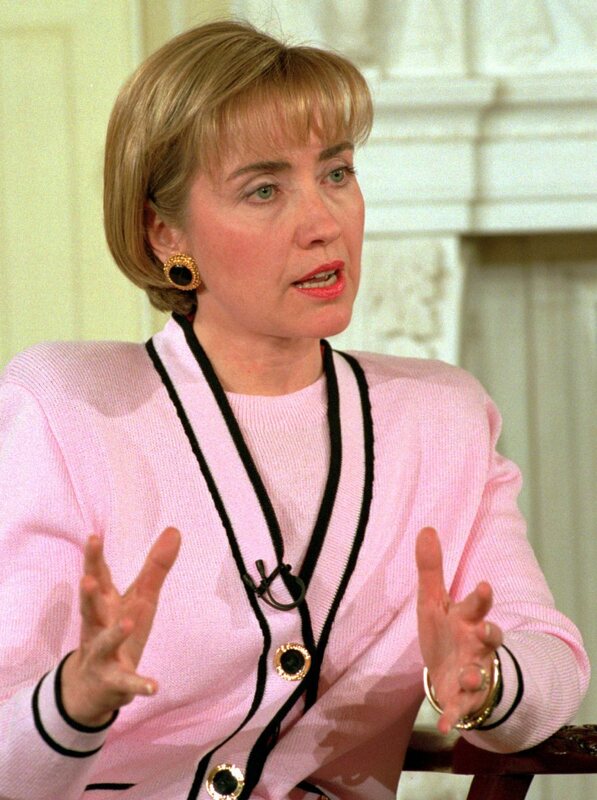 It was not until the 1992 Democratic Convention that she focused on a new wardrobe of suits in bright colors and cloth-covered buttons. It was a practical yet colorful style that continued through into her first years as First Lady. It was more her changing hairstyles rather than her clothes that seemed to merit the most attention in the fashion press. 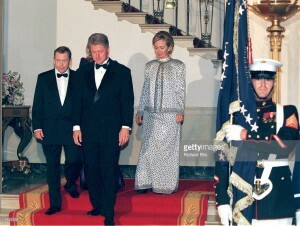 In the second Clinton term, however, she began to enjoy wearing highly stylish clothing, often appearing in evening gowns by the name designer Oscar De La Renta. 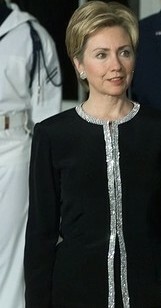 In the last few years of her tenure as First Lady, Hillary Clinton first began appearing in what has now become her signature style of pants suits. Tailored and in a wide gamut of colors, she wore these not only for overseas travel and daytime events around the country, but also in satins and with shimmering beads as formalwear for state occasions.